The arbitrator has ruled that members with commutation passes may be reimbursed for management's delay in issuing the passes. A reimbursement claim form is now available here. As you know, the contract agreed to with the MTA last spring provided for a “commutation” pass for use on LIRR and MNRR to members who live outside the five boroughs. TWU’s position was that this benefit should have been available as soon as the contract was ratified. The MTA rejected this and spent a few months putting a procedure into place for issuing temporary passes. When the MTA rejected our claim that members should be reimbursed for any fares they paid on LIRR or MNRR after the May 21 ratification date, we filed a grievance. The arbitrator issued his decision recently. He ruled that it was not reasonable to expect the MTA would have had temporary passes available on May 22, and they weren’t required to allow us to use our EPIC passes on LIRR and MNRR. However, he also found that they should have had the passes ready sooner than they were. As a result, he found the MTA liable to reimburse fares paid on MNRR or LIRR by TA and OA workers who were eligible for the commutation passes from July 1 until the date they received the pass (assuming they filed for the pass by August 1). He also set a firm time limit that the MTA must pay the reimbursement within 60 days of receiving the documentation supporting the expense claimed. To claim reimbursement for the fares you paid, download this form and follow the instructions for filing. 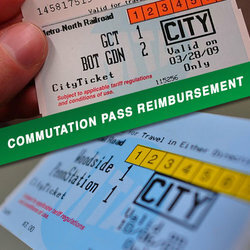 Don't claim any reimbursement if you have not been issued a Commutation Pass.